Thanks again guys for stopping in to BillyParisi.com to check out all of my recipes and videos, and on tap for today is this How to Make a Homemade Artisan Country Loaf Bread Recipe. It is to this day the best loaf of bread I have ever made. As I get more comfortable with baking homemade bread, each recipe just seems to get better and better. While the measurements are incredibly important, I’ll talk more on this later, technique and time are just as important if not more important. Regardless, I’ve been LOVING baking homemade bread just like this artisan country loaf recipe and I can’t see myself slowing down any time soon. Once you get your first really good loaf of homemade bread then it just pushes you to keep exploring and trying new things. Can you tell I’m excited about baking homemade bread yet lol? I made homemade bread a little bit throughout my food years since culinary school and to be honest I was a hack. In fact, I feel like I was a food hack with a lot of things but now I’ve got some more patience and am generally more interested in the creativity and creation of food then I’ve ever been before. I had a solid culinary education but to be honest my “on the job training” wasn’t all that awesome so most of my creativity had to come from myself. It’s not that I didn’t work with amazing chefs, I did, it’s just that they were much better chefs from a management and classical standpoint and didn’t put as much emphasis on pushing the envelope in the creativity department. I only tell you this because we never even made homemade bread when I was working at all those restaurants back in the day, we got it brought in. It’s simple things like making homemade bread, that can make all the difference in the world. I’ve been doing some reading lately and I have to say that the best book for homemade bread making techniques is Flour, Water, Salt, Yeast. 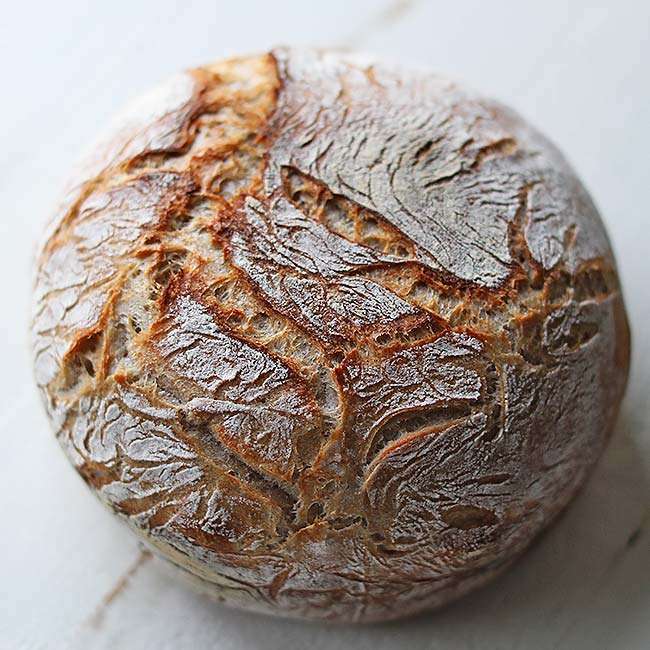 It’s incredibly informative about how to go about each step in the bread making process and honestly, it’s fool proof. It’s pretty much exactly what you would learn in a baking class in culinary school, except for when to add the yeast into the flour, salt and water. Regardless it’s a fantastic book for making bread if you are interested in getting into this fun cooking hobby. There are so many countries out there that have people who still make bread every single day. To me, baking homemade bread is a dying art form and while it does take time, there is nothing more satisfying then making it especially from something so simple. Bread, when done right, is loaded with all of the minerals and vitamins you need to sustain life. While I cheated a bit with this artisan country loaf bread recipe, the most traditional way would have been using a starter instead of yeast. However, most people who are just everyday cooks aren’t going to take the time and money it takes to feed a starter once a day so yeast is much more practical. To make this homemade bread recipe you are looking at about 5 hours. I think I said 3 hours and 45 minutes in the video but that’s really more dedicated to the resting and proofing time and not the actual folding and forming time. If you do this recipe you need to start in the morning so maybe the weekend is best. You are also going to get your hands dirty, so don’t even worry about breaking out the gigantic wooden spoon or spatula. It’s important to use your hands so you can feel the dough come together. You can’t do that with a spatula or spoon, you need to be touching it at all times so make sure there are no lumps. Lastly, I want to talk about measuring for bread. It is super important so if you are serious about this then I recommend investing in a metric scale. Measuring in grams is as precise as it gets and you just can’t get that with ounces or measuring spoons or cups, so pick up a metric scale. Homemade bread baking is a science and if you aren’t right on then you aren’t going to get the final product you need. Guys I hope you enjoyed the video as well as inspiring you to get out there and bake some fresh homemade bread, there’s nothing like it! 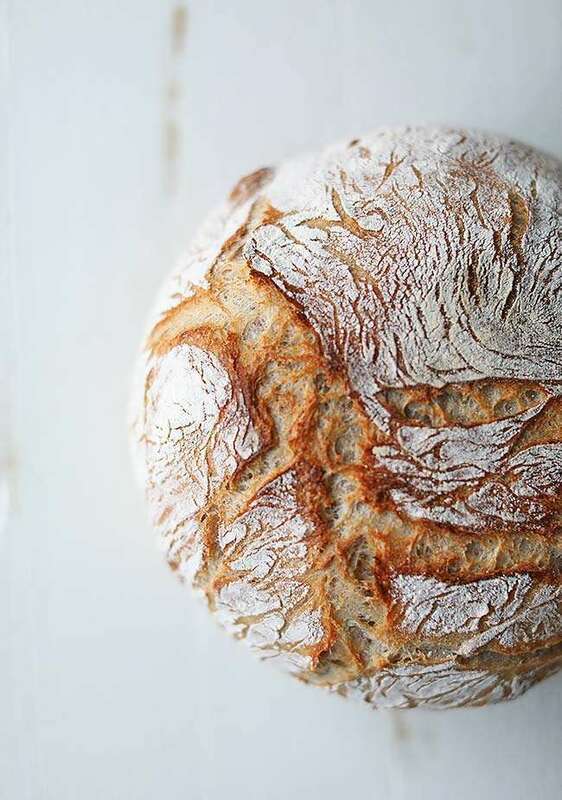 Bread should be light and fluffy on the inside with a beautiful hard crust on the outside. Learn How to Make a Homemade Artisan Country Loaf Bread Recipe! In a large bowl combine with your hands the flours and water until completely mixed together. Let rest for 10 minutes. Next, sprinkle the salt and yeast overtop and mix it into the dough by pinching, stretching and folding the dough over for 4 to 5 minutes. Cover and rest the dough in a warm dark place for 15 to 20 minutes before folding the dough over 5 to 6 times. Cover and rest for 45 to 60 minutes and then fold the dough over 5 to 6 times again. Cover and rest for 2 hours or until it has tripled in size. Dust a clean surface with flour and place the dough onto it. Sprinkle the top with flour and fold the dough over in thirds 3 to 4 times and then begin to mold the dough into a ball by cupping around the dough into the bottom. Place the dough into a floured Benetton and cover and rest for 60 minutes. In the meantime, place a small Dutch oven pot into the oven on 475° for at least 30 minutes. Let cool for 20 to 30 minutes before slicing and serving. How about printing this recipe with US measurements such as ounces, cups etc. A lot of us were not school with metrics! Unforuntaely, there will be no exact conversion from grams to ounces. Honestly I learned a long time ago, if you want to make perfect bread than you need perfect measurements and grams is the only way to get there. There may be some calculators out there to help you get close but there is no guarantee that this bread will turn out if you use ounces. Thank you Chef for not changing your recipe. It’s in US measurements as far as I can tell. I have used a scale for many years and the only way to truly get the same results is to go by your recipe. Thank you so much for sharing. I can’t wait to make it. Totally agree! Thanks for the encouraging words! Looks great I’m going to try this. When you flip it into the Dutch oven do you flip it straight in with the top down? This looks great- However, my Dutch oven is not small, as is the one in the video. Will this effect the outcome of the bread? It will just be flatter is all. Do you have a stone? Hi! I’ve made this recipe a few times now and it turns out perfect every time! my family loves it. I’m currently making it again but am experimenting with splitting it into two smaller loafs. do i need to cut the baking time down, or still do 30 minutes? Yeah, I would check after 22-25 minutes. If you see the bread starting to turn really dark on the outside then I would pull it. I am BEYOND ecstatic that this is working so well for you! Can you use rye flour instead of the wheat ? You may be able to use a few tablespoons but you will not get the same bread. Rye flour needs a ton of time to rise and even to that end it will not rise like white or wheat flour. Did you activate the yeast prior to adding it to the flour/water mixture? Or did you use Instant yeast?